Oral Hygiene San Marcos: Is It Time For Child to Visit the Dentist? Many parents understand the value of routine dental care for their children. 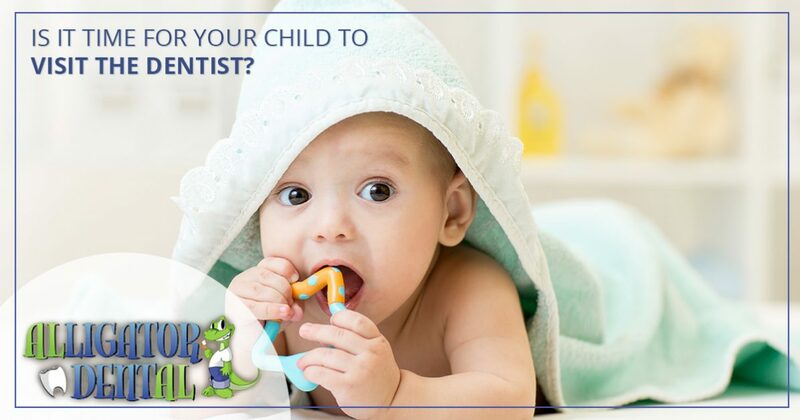 Getting your child into the dentist on a regular basis promotes a lifetime of bright, healthy smiles, and it encourages your child to take responsibility for their dental hygiene. Aside from teeth cleanings every six months, there are a few reasons that you may need to make a dental appointment in San Marcos for your child, and when you do, Alligator Dental will be here to help. We offer a wide variety of children’s dentistry services, and your child will love our fun, friendly atmosphere. Contact us today to schedule your child’s appointment! If you are a new parent, you may wonder when it is appropriate for your child to see the dentist for the first time. Your child’s first dental exam should take place within six months of the first baby tooth emerging and no later than your child’s first birthday. Taking your child to the dentist at an early age will help them become familiar with their dentist, the dental office, and the sounds associated with dental care. This enables trust to be built between your child and the dentist, establishes the foundation for excellent oral hygiene skills, and provides an educational opportunity for both you and your child. Parents often associate restorative dental care with adult teeth. Often times, the importance of baby teeth is overlooked; some may believe that they are not that important to care for since they will eventually be replaced with permanent teeth. This could not be farther from the truth. Baby teeth help form the developing jaw, hold space for the permanent teeth, and are essential to eating, speaking, and a healthy self-esteem. If one of your child’s baby teeth becomes infected or suffers from decay, it is important to have it filled or crowned right away to avoid unnecessary complications down the road. Another reason to take your child to the dentist on a regular basis is to ensure they receive the preventative dental care they need to avoid cavities, broken teeth, and other dental health concerns. Children often have a hard time brushing and flossing their teeth thoroughly, especially the back molars. Dental sealants are quick and easy to apply, and they can help seal out decay before it begins. Likewise, custom mouthguards can help protect your child’s teeth during sporting events, and they do a wonderful job at preventing teeth from being chipped or knocked out entirely. It is not uncommon for children to suffer injuries to their face, mouth, and teeth. In fact, there are many things which might constitute a dental emergency, and if you are worried that your child may be suffering from one of these troublesome conditions, it is best to bring them into the dentist as soon as possible. Your child’s dentist can perform a thorough exam and take x-rays if needed to determine the cause of your child’s discomfort, providing relief as soon as possible. Here at Alligator Dental, we take dental emergencies very seriously. We are happy to make an urgent dental appointment in San Marcos for your child between the hours of 7:30 a.m. and 10:00 a.m. on regular operating days. Make a Dental Appointment in San Marcos Today! 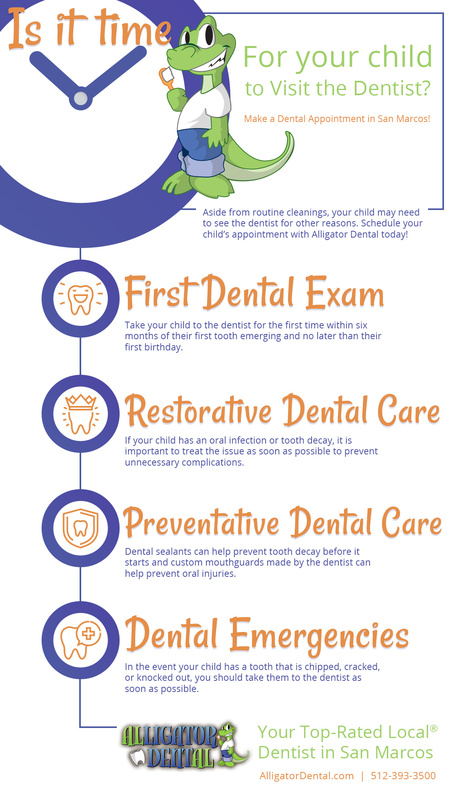 Whether you are bringing your child to the dentist for the first time, your child has suffered an oral injury, or you need more information about restorative and preventative dental care, Alligator Dental can help! When you make your dental appointment in San Marcos, our friendly team will spend time with you to understand your concerns about your child’s dental health in order to devise a sound treatment plan that is designed to suit your child’s unique needs. Call us at 512-393-3500 or schedule your appointment online!